You are here: Home / Why Cloud Computing? Properly deploying Cloud computing can provide many benefits which vary depending on your organization. For example, small to mid-market businesses can improve on compliance, controls, reporting, availability, scalability, reliability and technology (in many cases delivering business functionality) that they otherwise could not afford or maybe do not have the capability to deliver. Fast growing companies may wish to leverage capital in other areas of opportunity such as sales in lieu of investing in technology infrastructure. Larger organizations having an IT staff can utilize cloud computing so the IT organization may focus on more strategic activities and not worry about application infrastructure. All types of organizations can benefit from the agility and speed of change cloud computing offers. 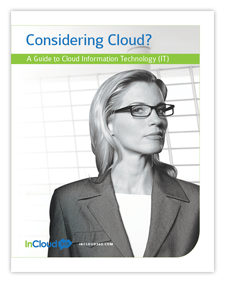 More than likely the answer is yes and it is a matter of how cloud computing is applied from an application, infrastructure and integration perspective. What problems can InCloud360 solve for you? Unfortunately, there is considerable marketing hype in the market place as companies with older technologies, perhaps even antiquated technology platforms, attempt to re-position themselves as Cloud computing service providers by redefining Cloud computing. Without a clear understanding of the newer technologies and the style in which to best deploy them, it can be difficult to create a risk/benefit analysis, a clear return on investment/total cost of ownership analysis, and develop a cloud adoption strategy that best fits your organization to which you and the executive team will have confidence in. InCloud360 can guide you through the risk/benefit analysis, return on investment and total cost of ownership assessment, and develop the most appropriate Cloud Computing adoption strategy to fit your business needs. InCloud360 will then, implement, integrate, customize and extend the services as needed to take advantage of cloud computing’s strengths. We make the cloud simple! Please contact us so we can explain how simple we can make it.